Background and Aims: Wireless capsule endoscopy (WCE) is used in Crohn's disease (CD) to define disease extent. We aimed to define WCE detection rate of small bowel ulcerative lesions and completion rate in CD patients. Patients and Methods: A total of 102 consecutive CD patients, who successfully passed patency capsule, were matched to 102 controls. WCE was performed in both patients (in acute phase and CD clinical remission) and controls. Results: Eighty-six (84%) controls versus 62 (61%) patients in the acute phase ( P = 0.003) and 96 (94%) in remission ( P = 0.02) completed WCE study. Gastric passing time was 48 ± 66 min in controls, 66 ± 82 min in CD acute phase ( P = 0.03) and 30 ± 21 min in remission ( P = 0.07). Small bowel passing time was 276 ± 78 min in controls, 299 ± 78 min in the acute phase of CD ( P = 0.04) and 248 ± 89 min in remission ( P = 0.01). Mean capsule endoscopy Crohn's disease activity index (CECDAI) score was 14 ± 6 in acute small bowel CD, 12 ± 7 in acute small-large bowel CD ( P = 0.08) and 2 ± 2 in both CD types while in remission ( P = 1.00). Small bowel ulcerative lesions in the acute phase were more frequently in distal small bowel. Aphthous ulcers were frequent a month after entering clinical remission and tend to disappear gradually later on. No ulcerative lesions were present in deep remission. Patency capsule is rather safe to exclude small bowel obstruction. Conclusions: (1) A high percentage of patients with active CD do not complete small bowel study with WCE. (2) Small bowel ulcerative lesions in clinical remission were less severe, although at least 6 months are needed in order for them to disappear. Background and Aims: The Helicobacter pylori CagA gene is a major virulence factor that plays an important role in gastric pathologies. The size variation of CagA gene, which is dependent on the 3' repeat region, contains one or more Glu-Pro-Ile-Tyr-Ala (EPIYA) motifs and CagA multimerization (CM) motifs. Four segments flanking the EPIYA motifs, EPIYA −A, −B, −C, or −D, were reported to play a crucial role in the pathogenesis of H. pylori infection. The aim was to determine the roles of EPIYA segments and CM motifs in gastroduodenal pathogenesis in an Iraqi population. Patients and Methods: Gastric biopsies were collected from 210 patients with gastritis, duodenal ulcer (DU), gastric ulcer (GU), and gastric cancer (GC). 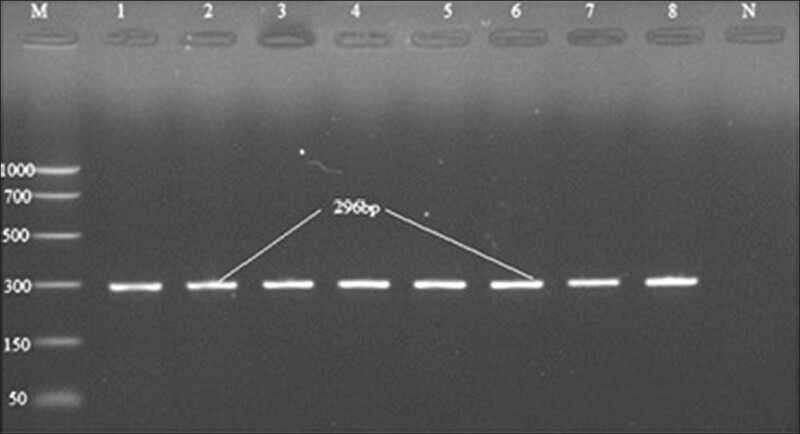 The EPIYA motif genotyping was determined by polymerase chain reaction and sequencing. The differences in age, gender, and CagA EPIYA motifs of H. pylori between GC, DU, GU and gastritis patients were analyzed using a χ 2 -test. Results : A total of 22 (45.8%) strains had three copies of EPIYA (ABC type), 2 (4.16%) had four copies (ABCC type), 6 (12.7%) had five copies (ABCCC type), 13 (27.08%) had two copies (AB type), 3 (6.25%) had the BC, and 2 (4.17%) had AC motif. The alignment of the deduced protein sequences confirmed that there were no East Asian type EPIYA-D sequences in Iraqi strains. A significant association was found between increase in number of EPIYA-C motifs and GU (P ≤ 0.01) compared with gastritis. Conclusions: The structure of the 3' region of the CagA gene in Iraqi strains was Western type with a variable number of EPIYA-C and CM motifs. 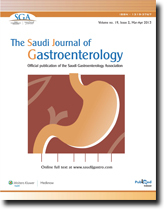 A significant association was found between increase in number of EPIYA-C motifs and GU compared with gastritis indicating predictive association with the severity of the disease. The GenBank accession numbers for the partial CagA nucleotide sequences determined in this study are JX164093-JX164112. Background and Aims: Complementary alternative medicine (CAM) covers many types of treatments and procedures that are usually not included in conventional medicine and are used in addition to physician-prescribed drugs to "complement" treatment. Although liver disease is prevalent in Saudi Arabia, not much is known about CAM use among Saudi liver disease patients. Thus, this study aimed to assess the prevalence of CAM use in these patients and their attitudes toward it. Materials and Methods: Patients were recruited randomly from a tertiary care hepatology clinic at King Khalid University Hospital (KKUH), Riyadh, Saudi Arabia from February 4 to March 20, 2012. A four-page questionnaire was used to interview patients. Results: Of all the 232 participants surveyed, 55.6% have used or are using CAM to treat their liver disease with 45.0% of CAM users stating that they believe it has a positive effect on their treatment. Honey was the most used CAM treatment among the participants (39.0%). 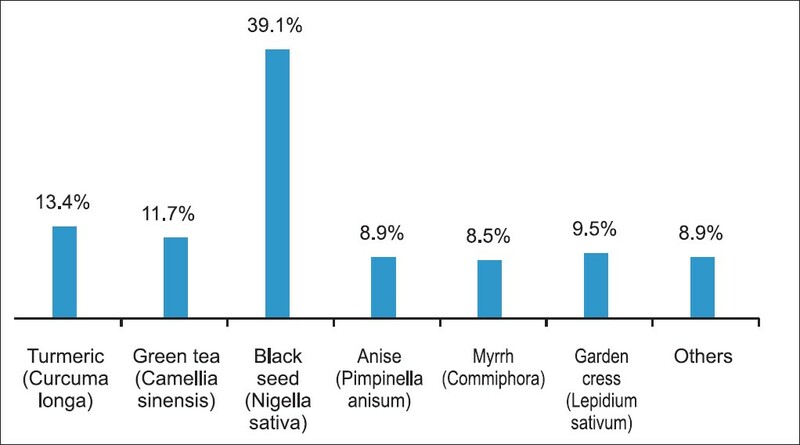 Herb use was represented by 31.8% of all users, while 13.5% used bloodletting as a treatment. Cautery was the least used CAM method (3.4%). Nearly 76.6% of CAM users were satisfied with using alternative treatments to help control their disease. Nearly 69.4% of users and nonusers stated that they believe CAM treatments to have numerous beneficial effects. Nearly 60.5% of CAM users stated that their physician had no knowledge of their CAM use. Of the factors included in linear multivariate regression analysis (including: Age, gender, and family CAM use, among other socioeconomic factors) only family CAM use was considered a significant independent factor affecting participants CAM use (Beta = 0.582, 95% CI: 0.372-0.754, P = 0.0001). Conclusion: More than half of the patients have reported CAM use. Overall, more than two-thirds of the entire sample believed that CAM treatments have numerous health benefits. Background and Aims: Acute hepatitis C is rarely diagnosed due to its predominantly asymptomatic course. However, early treatment results in viral eradication in a high number of patients thus, preventing chronicity. The aim of our study was to describe our experience with patients with acute hepatitis C virus (HCV) infection who presented and followed-up in our liver unit, pointing on treatment strategy, and outcome. Patients and Methods: Retrospective, descriptive study of 30 patients with acute HCV infection (26 males and 4 females) with a mean age of 32 years. Results: The source of infection was mainly injection drug use in 17/30 (56.7) and medical procedures 6/30 (20%). Twenty patients (66.6%) were symptomatic. HCV-ribonucleic acid (RNA) was detectable at presentation in 26 (86.7%) patients. The genotype distribution was: 13/26 (50%) genotype 1, 3/26 (11.5%) genotype 2, 8/26 (30.8%) genotype 3 and 2/26 (7.7%) genotype 4. Totally, 9 patients (30%) experienced spontaneous viral eradication. No significant differences could be documented between patients who spontaneously cleared the virus and those who had viral persistence. Thirteen patients (44%) were treated with peginterferon-based regimen. All patients (100%) achieved non-detectable HCV-RNA and had normal serum alanine aminotransferase levels at the end of the treatment. Eleven patients achieved sustained virologic response (SVR), one relapsed and one was lost to follow-up. The overall SVR rate was 84.6%. None of the patients required dose reduction or stopped the treatment due to side effects. Conclusion: In conclusion, early initiation of anti-viral treatment in patients with acute hepatitis C results in high-SVR rates (independently of genotype) and is well-tolerated. Background and Aims: A number of studies in adults have evaluated the prevalence of gallstones in the diabetic population and showed a significant association with type 1 diabetes (T1D) and type 2 diabetes. The pediatric literature is limited to a single small case series. We conducted a cross-sectional study to evaluate for the presence of association between T1D in children and gallstones formation. Patients and Methods: Children diagnosed with T1D in a diabetic clinic have been examined for existence of gall bladder stone formation from November 2008 through November 2009. All have been subjected to the following: History, physical examination, blood tests (liver function tests, lipid profile, glycosylated hemoglobin [HbA1C]), and an ultrasound (US) of the gall bladder. Results: One hundred and five children with T1D have been enrolled consecutively over a 1-year period: age ranged between 8 months and 15.5 years, 62 patients were females. The mean age at diagnosis was 6.3 ± 2.9 years (range 0.85-11 years), mean duration of T1D was 2.2 ± 2.1 years (range 0.2-8 years), mean body mass index was 16.5 ± 3.4, mean HbA1c was 10.7 ± 2.4%, and 61.3% of patients had a HbA1c level >10%. The mean serum cholesterol was 4.16 ± 0.75 mmol/L (normal 3.65-5.15 mmol/L) and mean serum triglyceride 1.02 ± 1.3 mmol/L (normal 0-1.7 mmol/L). Two patients had hyperlipidemia. 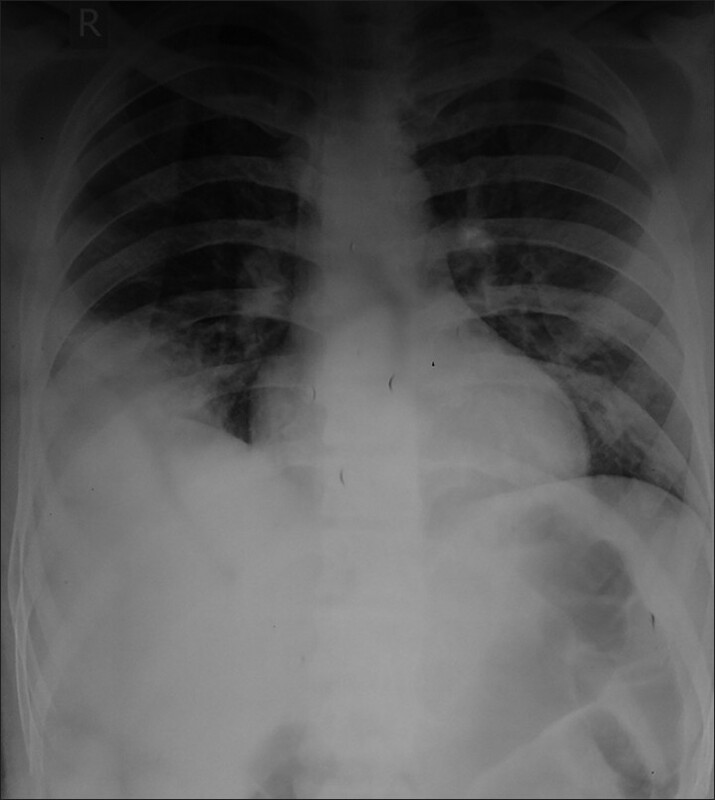 US of the gallbladder did not show any case of gallstones or sludge formation. Conclusion: Data from our study do not show any association between T1D in children and gallstones formation, with diabetes duration of less than 8 years. The relatively short duration of diabetes and possibility that our study was underpowered might have been reasons for the absence of any association. Background and Aims: Tacrolimus is a macrolide immunosuppressant used for prevention of allograft rejection in organ transplantation and metabolized in the liver and intestine by cytochrome P450 3A4 (CYP3A4) enzyme. A single nucleotide polymorphism (SNP) in the CYP3A4 promoter region has been identified. It has been shown that the presence of CYP3A4*1B allele (variant GG) is associated with a reduced catalytic activity of CYP3A4 in vivo. The aim of this study was to determine the role of CYP3A4*1B on tacrolimus dosing and clinical outcome in liver transplant recipients. 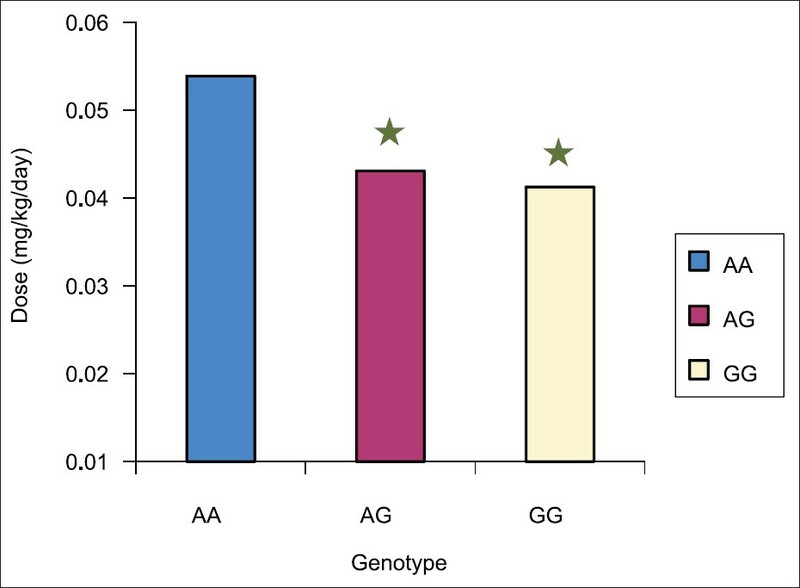 Subjects and Methods: Forty-eight liver transplant recipients were stratified according to the genotype. There were 32 wild-type (AA) patients and 5 homozygous variant (GG) and 11 (AG) heterozygous. Tacrolimus doses and trough concentrations as well as phenotypic data were collected in the first 10 days of the transplant. Results: The tacrolimus concentration was significantly higher in the wild (AA) group as compared to homozygous variant (GG) and heterozygous (AG) patients. Homozygous variant (GG) group had significantly lower dose requirements. However, no significant difference was observed in the concentration/dose ratio between all groups. Conclusions: Based on our results, it may be concluded that CYP3A4*1B of recipient is an important factor influencing pharmacokinetic of tacrolimus, as patients with CYP3A4*1B polymorphism may require lower tacrolimus doses to maintain therapeutic levels. The dose reduction may not affect clinical outcomes after liver transplant.